EGST Director, Dr Misgana Mathewos is officiated ordained minister of Ethiopian Evangelical Church Mekane Yesus (EECMY) on Sunday September 2, 2018 at a ceremony held in Mekanissa Mekane Yesus Congregation. Rev. Tsigie Bereda, Director of Mission and Theology Department of Addis Ababa Synod who presented five candidates including Dr Misgana reported that the ordination was conferred upon the candidates by the call of Mekanissa Mekane Yesus and Yerer Terera Congregations and approval by the Council of Addis Ababa Synod. She noted that the candidates completed the necessary theoretical and practical trainings offered by the EECMY-Department of Mission and Theology. 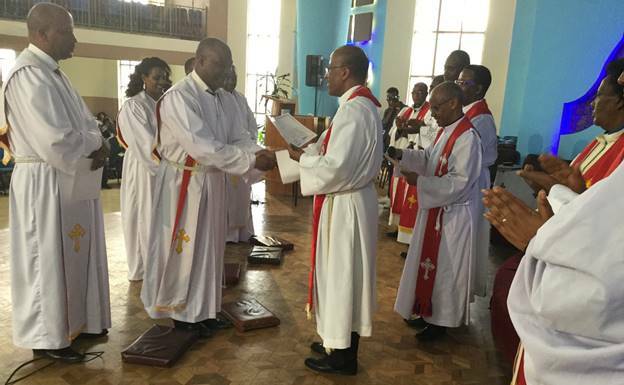 The ordination of Dr Misgana and others on the day gives certification and authority to serve the 9.5 million members of EECMY as indicated by the EECMY President, Rev Yonas Yigezu. However, it does not require him to leave the EGST position. ‘The Ordination is a lifelong service intended to minister the Word and sacraments and to shepherd God’s flock ‘Rev. Yonas emphasized. It was recalled that two of the ordained ministers, Rev. Essey Miressa and Rev. Motuma Bedassa, are the EGST Alumni. Concurrently, the Board Chairperson of EGST, Rev. Teshome Amenu was appointed and officiated as the General Secretary of EECMY at the 14th Council of the Church held at Gudina Tumsa Training Centre. It was learnt that Rev. Teshome succeeded Rev. Dr. Berhanu Ofgah who served the Church as General Secretary for the last 9 years. It is further projected that the appointment of Rev. Teshome will have implications for EGST leadership composition at the Council of Owners and Board levels. While Rev. Teshome is anticipated to join the EGST Council of Owners, EGST Board Chairmanship is likely to be replaced by another Officer. The services were presided by Rev. Yonas Yigezu, the EECMY President, and Rev. Dr. Kiros Lakew, the EECMY vice President and the Addis Ababa Synod President. EGST extends its congratulations to Rev. Teshome Amenu and Rev. Dr. Misgana Mathewos and prays for God’s guidance and wisdom as they embark on these important ministries [EGST PRC].